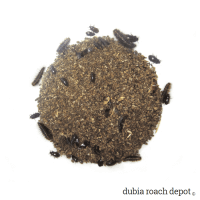 Lesser mealworms are generalist feeders that multiply quickly, require almost no effort, and make excellent cleaner crews for Dubia roach colonies. The lesser mealworm (Alphitobius diaperinus) is a common cleaner species known for preventing food particle build-up and removing undigested organic matter from frass. This helps keep roach colonies relatively clean and healthy. Each Kit comes with around 30 insects in a mix of beetles, larvae, pupae, and microscopic eggs. Like all cleaner species, lesser mealworms are naturally roach-friendly. 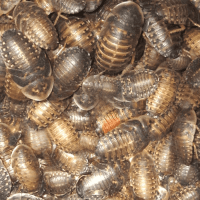 They don’t harass roaches, and they’re a good choice if you want to grow a large, high-capacity cleaning colony quickly. They are often prolific, with a personality all their own. To start, they multiply quickly and need very little if any care. In fact, you may find yourself taking steps to reduce their population in time. They don’t become aggressive toward roaches, but they may compete for food. This can be managed though, and we’ve written about how do this in our Guidance & Information section. As a generalist feeder, these guys will eat almost any plant-based food. In the wild they inhabit manure piles where they lay their eggs and eat undigested food particles. This makes them ideal for a frass-heavy roach colony. They love frass, and that is where they spend most of their time. Lesser mealworms also love starchy vegetables. In addition to eating them, they will also lay eggs in them if they get the chance. 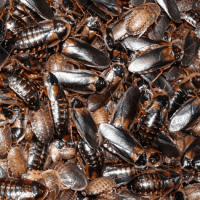 This could be a problem if you leave vegetables strewn on the bin floor, but you can manage this by placing vegetable matter intended as food for your roaches in a bowl. The mealworms will still find it, but it tends to slow them down significantly. Lesser mealworms have a strong preference for vegetable matter over dead roaches, but they will eat them in certain conditions. We consider these insects strong frass and vegetation cleaners and a weak cleaner of dead roaches. This makes them best suited for those who either (a) manually remove dead roaches, which is doable with one colony or a few small ones, or (b) use them with Dermestid beetles. It’s also worth noting that combining lesser mealworms and Dermestid beetles as cleaner crews has useful synergies. One insect focuses on frass while the other prefers dead roaches. One reproduces relatively fast while the other is slower. Both reproduce faster than Dubia roaches so they easily adapt to current roach population – whatever that may be. Neither insect bothers roaches or each other, and either one alone is better than none at all…and in our experience the combination is the most efficient of all. This is to give you an idea of the cleaning capacity of the Lesser Mealworm Cleaner Crew kit out of the box. It is roughly the number of Kits a colony/enclosure of a certain size might need for immediate full cleaning capacity. It’s not the number of Kits you need to buy for a certain colony size. You can always start with one and let them grow into the job. NOTE: Square feet is “floor space”, not volume. To calculate, multiple length x width in feet, i.e. (1.5 ft. x 2.5 ft.) = 3.75 sq.ft., or length x width in inches, then divide by 144 (1 sq.ft), i.e. (18 in. x 30 in. )/144 = 3.75 sq.ft. Because they are not a tropical species like our roaches, beetles can be shipped safely in lower temperatures. Please see our heat & cold pack page for more information about shipping lesser mealworms to your location. Unlike Dermestid beetles, lesser mealworms cannot fly so escape is less likely. However, there is a possibility that they could cause damage if they escape. We aren’t aware of any reports of problems from roach-keepers using them as cleaning crews, but that doesn’t mean the potential doesn’t exist. Be sure you can safely house your lesser mealworms before you buy them. Ours chew up the cardboard that we use in our roach colonies over time, and in theory they could do this to other materials outside the enclosure if they were to escape. 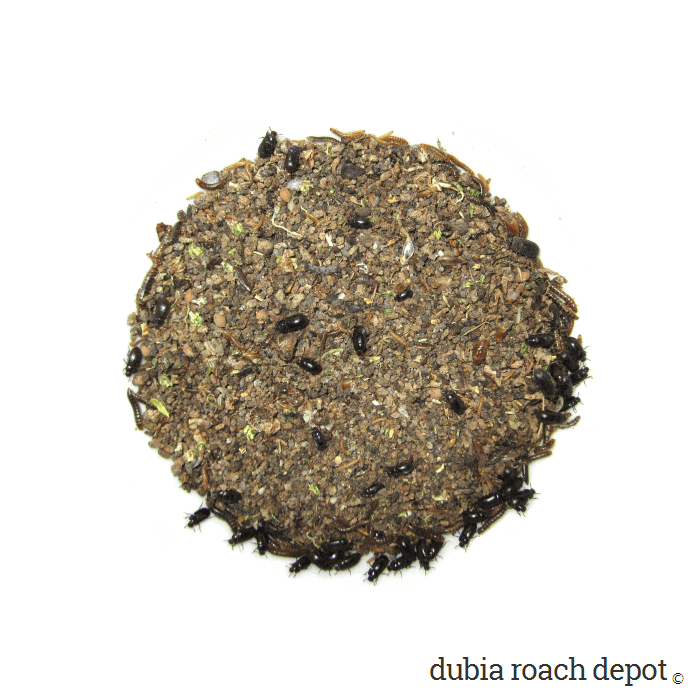 I highly recommend Dubia Roach Depot! They have GREAT prices for the HEALTHIEST roaches! I’m not even kidding. I ordered from other sites in the past and the roaches were just OK. I didn’t realize it until I ordered Dubia from you guys and had something to compare to. Your roaches are very, very healthy. My animals LOVE them, shipping is lightning speed, and I’m very happy and a loyal customer. I’m very glad I found you guys!